Learn Oil Painting In This Free Tutorial. The first Oil Painting Technique I will show you is Alla Prima This is an Italian expression which roughly translates as At the first try. This exercise should be completed in one session for the best results. 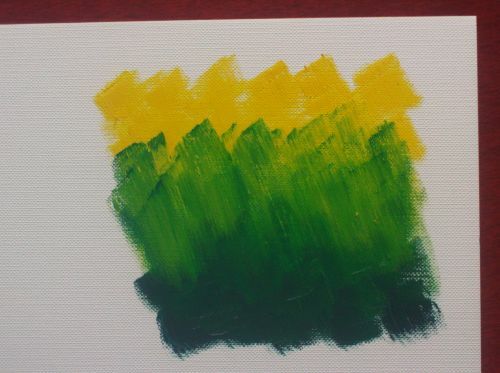 1, Use a flat brush, half or one inch. 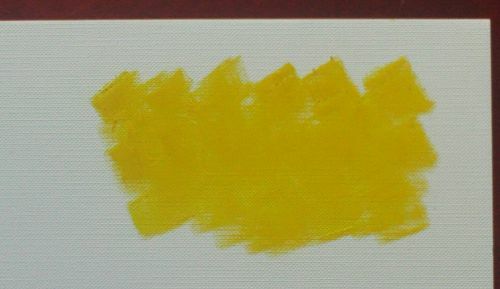 This technique works best with thick paint so use only a little thinner and apply your colour, pale cadmium yellow in this case, on your chosen surface in short strokes. 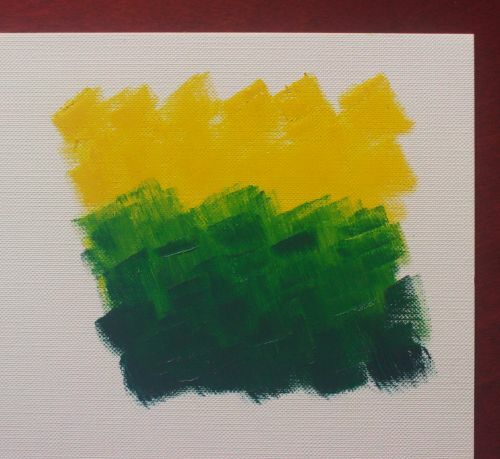 I am using canvas paper, a good, inexpensive paper to practice on. 2, Build the colour up into a loose shape. 3, Now switch to another colour. 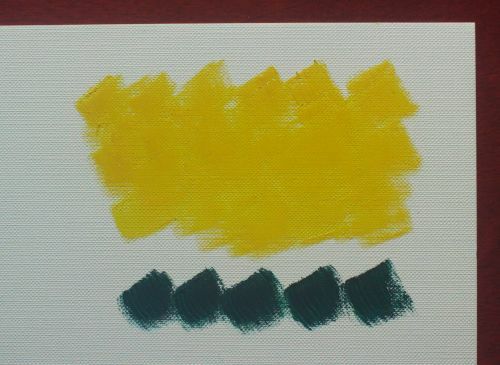 Here I am using Veridian because it contrasts strongly against the yellow, and repeat the process. Paint quickly and try not to go over the same area more than once. 4, Add more blocks of colour. 5, Work the yellow into the veridian allowing them to mix gently. See how interesting the paint begins to appear. It catches light where the paint is thickest and the colours are subtly blending without the need to actively melt them together. You get better results by working the lighter colour into the darker one but experiment with this and use different colours to see how the affect one another. 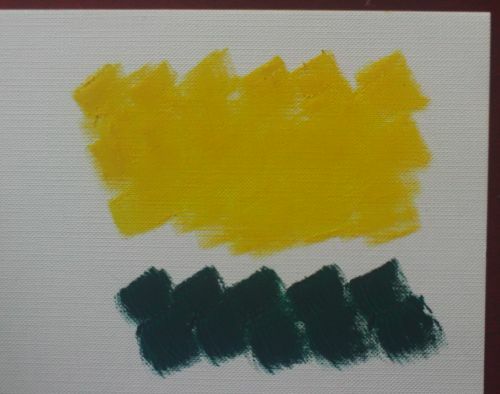 6, The colours have mixed giving some nice tones of green and yellow. See how adept this method is at conveying light falling on the ground. Use this method to paint foliage and grass for a lively scene. This technique is great for working outside on landscapes or even more intimate garden paintings. Practice this with different colours. Add browns and reds to create autumn scenes. Take a look at this close up. Note how the paint is nicely textured across the ground. You have learned in a simple excercise all you need to know about Alla Prima to begin with. It is a fantastically easy method. It is a small step from here to painting an entire picture in Alla Prima. All you need is a subject and a colour scheme. Try different combinations of colour then apply it to any subject matter you wish. Better still carry on exploring more free tutorials within from-sketch-to-oil-painting.com and really learn to fly. 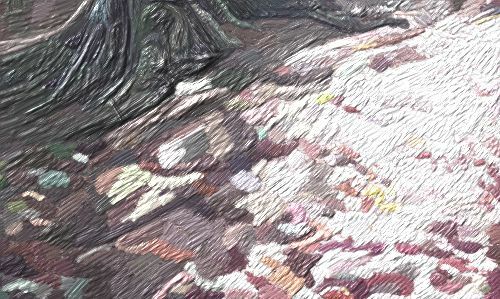 Each Oil Painting Technique will arm you with the skills to create your own original art.